But could we get one pic where all of us were looking at the camera and smiling? Um, no. 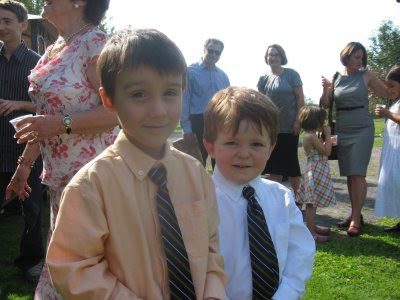 Updated to add this cute pic of D. and my nephew, in their matching ties. S. had a matching one, too. My sister found this when she googled me the other day. It's funny how something can be simultaneously extremely cool and utterly terrifying. That's not the final title and it's not coming out until the spring of 2009. Even so, I am embarassed to say how many times I have clicked on this link, just to prove to myself it's still there. I have been out of town for a couple of days, spending time with friends at their cottage. 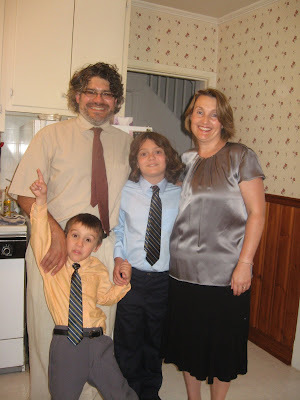 We were four adults, four boys ranging in age from 17 months to 11 years and five dogs of various ages and sizes. It was barely controlled chaos and absolute bliss. I am home now. In a few minutes I will turn off the computer and go curl up with a good book and a slice of my friend M.'s divine lemon pound cake (it contains an entire cup of butter and six cups of sugar. That's before icing) Perhaps I'll even have a ice cold cider with the cake. In other news, I have a new post up at MyBreastCancerNetwork.Com, called "The Challenge of the Twenty Second Update." This past week end, I went to a beautiful wedding with my family. In attendance were relatives I hadn’t seen in many years, lots of people I had never met and one of my favourite teachers from grade school. No one wants to drop the c-word at a wedding, least of all me. I hope you are all enjoying summer's last gasp with your own cold cider and lemon pound cake. Or whatever it is that makes you happy. When I am done, I will crawl off the bed a lot more slowly than I climbed onto it and my friend will take me home. For the next few days, I will feel like I have the flu. As my physical symptoms improve, my mood will worsen. By Friday, I will have to keep reminding myself that my rage and my sorrow are temporary. And then Saturday will come and I will feel (more or less) like myself again. If all goes well, things will continue like this over the next few months. Chemotherapy every four weeks. Clean scans every few months. And my echocardiograms will show that my heart still beats strongly and with regularity. I am left with little to tell about my life as a cancer patient that is earth shatteringly new. But, as my spouse is quick to point out to me, when you have metastatic cancer of any kind, boring is very good indeed. Updated to say that my spouse thinks I should have edited my leg out of the second picture. I am feeling extremely lazy today, so I can't be bothered. I think it looks fine, as it is. Updated again: A very nice reader of this blog cropped the pic for me and I concede that it really does look much better. It took me a while to do (I cut myself some slack when I am in my jammies for days on end) but it was fun. 1- I don't know as much about food as I thought I did. I had to look a lot of these things up. 2-I am not as adventurous as I was in my younger days. Not sure that I would eat frogs' legs now. Or that I would have turned down head cheese, had I been offered it when I was younger. One of my least favourite of household chores is the making of school and day camp lunches. It is an entirely thankless task, one in which I often see the results of my efforts returned at the end of the day. And, ten year old S., in particular, has told me on more than one occasion that the lunches I make are not nearly as good as those of his peers. I am not sure if this is because white bread, sugary drinks and most highly processed treats are off the menu, if his perception is distorted or if my lack of enthusiasm for the task is reflected in the end product. At any rate, I have not had to pack him a lunch in a while and I haven't missed it. However, S. has spent the last couple of weeks staying with his Grandma and attending a day camp at the Royal Ontario Museum (an animation camp. They are making movies!). On the first day, Grandma asked S. what she should make him for lunch. "Mama always makes me a ham and cheese sandwich with butter and a little bit of hot sauce." Perhaps my efforts have not gone entirely unappreciated after all. I have far too much on my plate right now to go to chemo. Meanwhile, I have a post up at MyBreastCancerNetwork.Com. At first, I wanted so much to maintain my professional identity, to be the smart, strong person who just happens to be going through cancer treatment. I didn't want to be like those grey, wispy, shadowed people sitting in the waiting room in their headscarfs and their wheelchairs. When I had surgery and couldn't wash my own hair, it was hard to accept help because it just drove home my incapability. When I couldn't walk outside for a full half hour at a time, I felt the loss of my physicality more than I had ever felt its presence. What the writer doesn't say, and what happened too slowly for me to watch, is that you really can go back to something like your old life, and leave that self-loss behind; but it's almost like a projection of your old life, one rendered in all the same colors and moving in the same patterns, but against a different screen, parallel to the old but never quite touching. I cannot say how much this spoke to me, even though Jenny has completed treatment and mine is ongoing. I have been thinking a lot lately about how strongly I feel about wanting to be seen as strong, vibrant and above all well, that I have even become defensive when anyone implies otherwise. You can read the rest of Jenny's post here. 1. I have been in such a good mood since my manuscript came back from my editor. I think I am just basically relieved that she didn't say, "This is a piece of sh*t and I have no idea why we said we would publish it." Sometimes it pays to set your expectations really low. 2. I am finding time management or the organization of my day to be a real challenge. No matter what thing I do well on any given day, there are several that I should have done and didn't. 3. I am very sad that Jeremy Hinzman is being deported. 4. I took a deep breath and gave some thought to an email before I wrote it today. In doing so, I realized that the other person had raised some valid points. I think cancer has made me grow up a little. 5. I am very psyched for the Ottawa Folk Festival. It had better not rain (as it has almost every day this summer). We had such a good time last year. Today's blog is brought to you by other people. Only they don't know it yet. I Don't Want to Be Dooce by Sassymonkey. The internet can be such an interesting place, no? 1. When it comes to John Edwards and his affair, I am just about completely indifferent. Elizabeth, however, remains my hero. 2. I realize that I never did blog about meeting her at BlogHer last year. I'll have to do that. 3. I looked up the live-blog of my session at this year's BlogHer and found this. It feels a bit to me like she wasn't at the same session as I was. I remember lots of laughter and a mostly hopeful message. Am I being over-sensitive? Also, I thought live-blogging was meant to be straight-up recording not editorial comment. Feel free to set me straight on this. 4. I have been running with my ten year old son and my big dog. We are now at the place in our program when we run 8 minutes and walk 1 minute (twice) and then run for two minutes (for a total of 18 minutes of running). When I was diagnosed with mets, I threw out my running shoes, so sure was I that I would never do this again. I am so proud of myself and so happy to be running with my son. 5. Yesterday, in my son's absence, I decided to initiate the puppy to running. I had the big dog tied around my waist and held the leash for the little one in my hands. I looked like the crazy dog lady. I know that we have to be careful not to push puppies too hard but I am a VERY slow runner and I kept checking to see if she was flagging. After the run, I took her to the dog park and she tore around some more. I don't think that I pushed her too hard. 6. Today, a big dog walked up to me in the dog park and peed all over my legs and my nice red sandals. The owner was barely apologetic. I would have been mortified. 7. My spouse and I are giving his cousin some wine as a wedding present. We have been using this as an excuse to do our own wine tasting. We currently have three open bottles, going to vinegar. 8. When I won the DS at BlogHer, I thought I would just give it to my kids. Who knew there were such fun games for adults? The game came with a crossword game (I am hooked on the anagrams) and I got two more brain enhancing games for my birthday. It turns out that I am not very smart. And I am having to ration my game time. 9. I wanted Katee to win So You Think You Can Dance. Joshua was my second choice, though, so I'm OK with that. I started watching by accident when they were at the Top Ten. I was quickly hooked. I hadn't actually watched any TV in months. 10. My book just came from my editor. It's time for my last crack at revisions. She was happy with it, thank goodness. I have been glad for the break from it and feel ready to get back at it. 11. What I really feel like doing is walking the dogs, knitting, eating and reading. Oh and hanging out with my family, too. 12. Thanks for all the birthday wishes. It really was wonderful. I slept in, ate lots of goodies and spent time with some people I really love. Great day.